The Tax Transcript Decoder© is a visual guide to assist financial aid administrators with quickly identifying the correct transcript line items needed to complete the verification process. 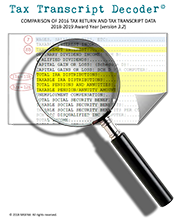 This tool contains color-coded sample tax returns and corresponding tax return transcripts for each return type. The decoder also includes a sample Form W-2 cross-referenced with a W-2 Wage and Tax Statement and information to help determine whether an individual was eligible to file a 1040A or 1040EZ.